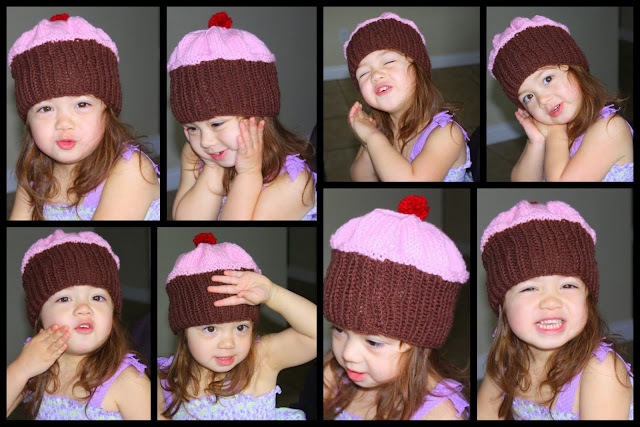 Anyways, here is a collage of my Pebbles modelling her cupcake hat. Enjoy! Here is another version of my cupcake hat, white frosting and I made it smaller for a baby around 3 to 6 months. This wonderful bright beret pattern by Amanda Keeys was really easy to knit up in no time. As you can see, my little model just loves the color purple! 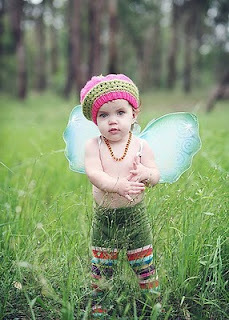 I have always wanted to knit a baby jumper or dress that didn't take forever to finish and wasn't on size 2mm needles! So I thought I would attempt a pattern with chunky yarn and a big set of 12mm needles. This dress knitted up quick enough, but I think I will use smaller needles next time for a denser knit. Once I perfect the pattern, I will post it up. This feather and fan pattern was taken from a bernat pattern. Although I ended up using 6mm needles and No.5 chunky aran yarn, it ended up that when I casted on 62 sts, the hat is bgi enough for an adult! Oh well, I just got to knit this again in a baby size. Other than that, I love the pattern, oh so easy, and great for charities and donations! Keep those little ones warm! This is the Baby Sophisticate Pattern knitted in the bigger size. In a rose pink color and with some flowery metal buttons, who says it's a pattern just for boys? I found The Baby Sophisticate Cardigan pattern by Linden Heflin and I thought, "This can't possibly be as easy as it says." Sure enough, it was quick to knit and really a stylish pattern to make for a little one. Probably one of my favourite patterns so far, I also knit a little hat to go with it. The Baby Sophisticate Pattern I noticed had some errors (eg. suppose to be 25 sts per sleeve, but it says 23). And it says K when you are suppose to P. But other than that, it is such a beautiful pattern that I am glad is shared with the world. Thank you Linden Heflin!